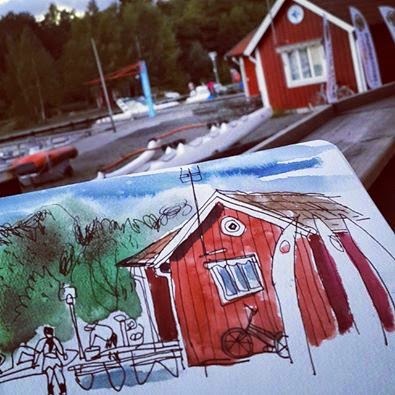 I'm continuing my previous post about our trip to Sweden where I promised to post sketches from our trips to Stockholm. Stockholm is, in my opinion, one of the most beautiful cities in the world: located on the Archipelago, with numerous bridges connecting different parts of the city, drowning in green and, of course, with its beautiful streets - products of Sweden's famous architecture and design! By the way, the influence of Swedish design, with its simplicity, minimalism and functionality, strong colors, and combination of preserving the past while using revolutionary new ideas, was felt everywhere, in every tiny peripheral village. 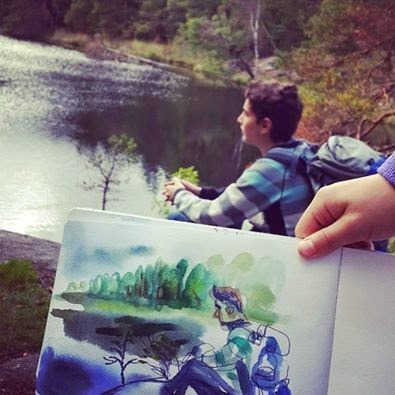 As our cottage was half an hour drive from Stockholm, we could combine our explorations of nature with urban trips. Stockholm has great coffee shops! at Trivoli Grona Lund - even an amusements park is charming in Stockholm! What can I say to sum up? I'm totally in love with Sweden and I hope it wasn't my last trip there. You can find my entire Swedish sketchbook on Flickr. A week ago we came back from a small family vacation in Sweden. Sweden isn't one of the hottest tourist destinations, and in our book store I couldn't even find a guide about it. There are a lot of places with much more spectacular and dramatic scenery and views, more attractions, and with richer histories. But all we wanted was a calm and cool place with simple nature close to our house, and a big city not very far away in case we missed urban life…. And, the most important element, a place where there was no need to rush around, nor run from attraction to attraction, but simply offered us the opportunity to escape from the heat and pressure here, and to find ourselves living in a different kind of world. In our farm cottage that we rented close to beautiful Stockholm we got this all, and much more! 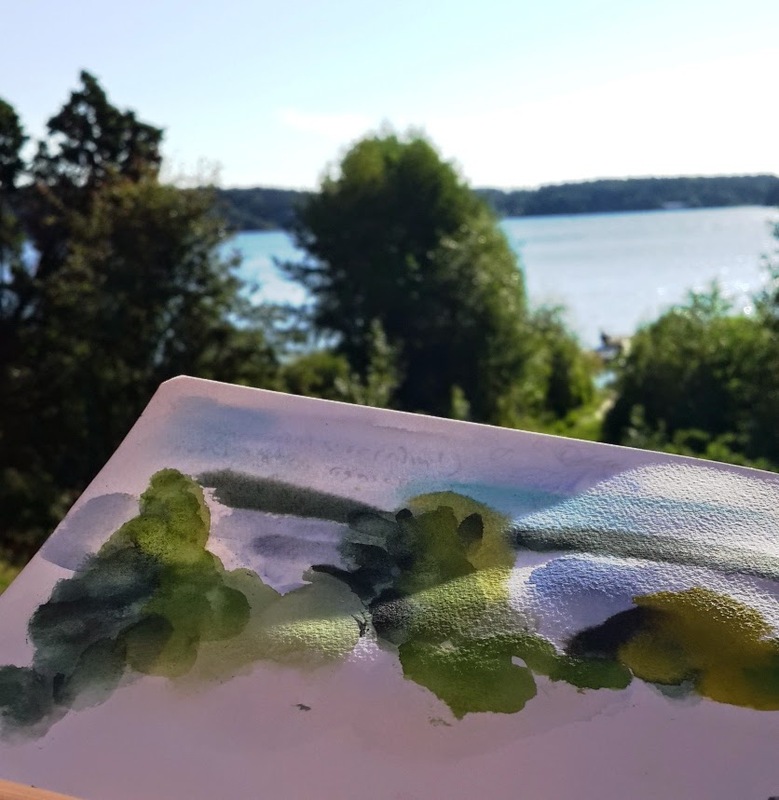 As usual on family trips I couldn't sketch everything I wanted to, but every page in my Swedish sketchbook reminds me of all those precious moments I had during this charming trip. 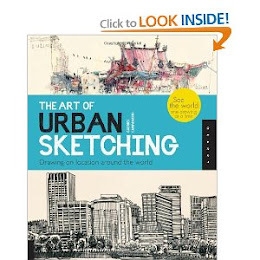 I'll start with sketches done around or inside the house - honestly, I didn't need anything else: just to wake up every morning to this spectacular (for me!) view of the lake from our balcony, and to be minutes from a real forest full of smells, sounds, mushrooms, berries and memories of my childhood. during our first walk in the nearby forest - it was like going to back to the childhood! Here are some more sketches from the closest surrounding - small towns and villages, and again - lakes and forests! drinking coffee in Ekerö main coffee shop - miss its bakery! I'll tell you about our Stockholm trips in the next post. 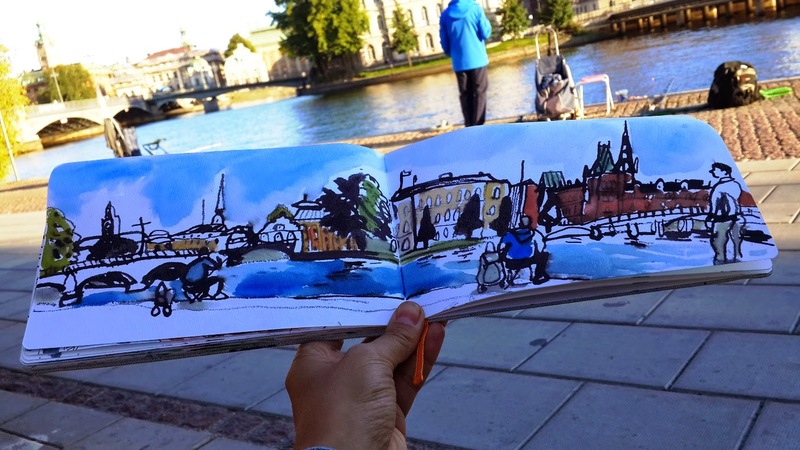 Meanwhile, you can find the entire Sweden sketchbook on flickr.